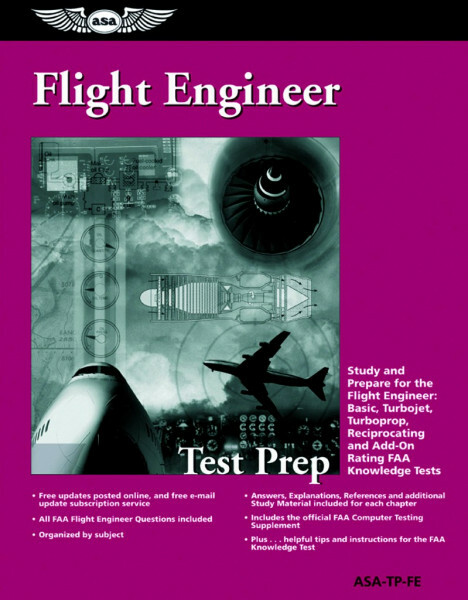 ASA's Flight Engineer Test Prep is now back in print! All Flight Engineer questions arranged by subject into chapters with Answers, Explanations (for correct and incorrect answers) and Reference Codes for Basic, Turbojet, Turboprop, Reciprocating, and Add-On Ratings. Helpful test instructions, tips, excellent cross-references, and more included. 344 pages. ASA is the leading resource for FAA Knowledge Exam preparation and continues to produce the best books available to prepare students for all the exams. The FAA tests are on a one-year cycle, with changes made up to 3 times a year. We make sure you have the most current information by posting updates on the ASA website that show changes made to the test questions, and providing a free email subscription service for automatic notification of when Updates are available.